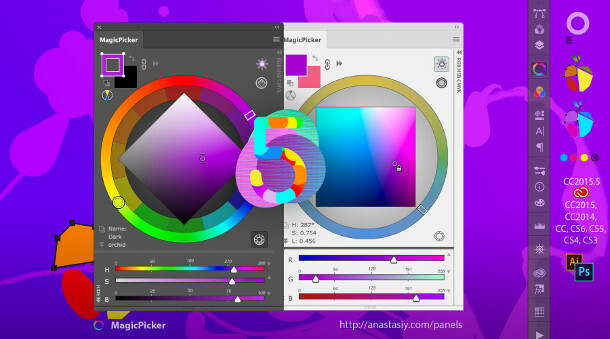 Developer Anastasiy Safari has released MagicPicker 5.0: an update to his colour wheel and colour-picker tool for Photoshop and Illustrator, adding the option to colorize vector shapes in Photoshop. The plugin, used by artists at studios including Disney, Marvel and Epic Games, adds a resizable colour wheel to its host application’s interface, with a range of preset colour schemes. It has a range of neat features, including the option to lock the gamma of your colour palette – meaning new colours automatically match the background of an image – or to lock the black level of CMYK colours for print. Particularly in Photoshop, it helps turn the host software from a general-purpose image-editing tool to something more specifically tailored to digital painting and concept work. In MagicPicker 5.0, Photoshop users get the Illustrator-like ability to colorize vector shapes and text, with options to shift the hue of groups of shapes simultaneously, and assign transparent colours to fills and strokes. UI changes include the option to display the current colour space values – as well as the standard RGB, CMYK and HSB, MagicPicker supports YUV, YCbCr and XYZ – or HTML/X11 colour name on the colour wheel. In addition, the UI has been redesigned to display better on HiDPI displays; and there are now inline tutorials to explain how the plugin works, activated by clicking on UI elements. There are also a number of smaller new features and bugfixes which you can find via the link below. MagicPicker 5.0 is available now for Photoshop and Illustrator CS3 and above on Windows and Mac OS X. 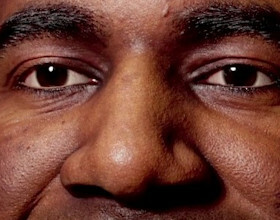 It costs $19.